This arm chair has beautiful coastal style. The solid mahogany frame and woven abaca back add to the coastal look, but they also bring in a light natural feel. This chair is very versatile because of its styling. It can bring a coastal flair to your dining room, or it can be used in a non dining setting. This chair would also be a great way to brighten up a darker room by creating a welcoming space to chat and relax. 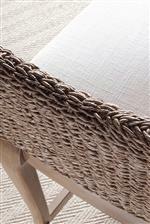 The Morro Coastal Arm Chair with Woven Frame by Artistica at Alison Craig Home Furnishings in the Naples, Fort Myers, Pelican Bay, Pine Ridge, Bonita Spring, Golden Gate, Estero, Cape Coral, Marco Island, Sanibel/Captiva Island, Point Charlotte, Ave Maria, Florida area. Product availability may vary. Contact us for the most current availability on this product. Fabric Options Only available in fabric pictured. Warranty Limited one (1) year warranty. The solid mahogany construction and natural vanilla coloration of the upholstered seats gives this collection a coastal yet natural feel. In keeping with this style is the woven abaca frame of the chairs. The colors, clean lines, and textures blend seamlessly together to add just a hint of sophistication as well. All this creates chairs perfect for enjoying morning coffee in or for entertaining your friends over dinner. The Morro collection is a great option if you are looking for Coastal furniture in the Naples, Fort Myers, Pelican Bay, Pine Ridge, Bonita Spring, Golden Gate, Estero, Cape Coral, Marco Island, Sanibel/Captiva Island, Point Charlotte, Ave Maria, Florida area. The woven abaca frame brings a coastal flair. Browse other items in the Morro collection from Alison Craig Home Furnishings in the Naples, Fort Myers, Pelican Bay, Pine Ridge, Bonita Spring, Golden Gate, Estero, Cape Coral, Marco Island, Sanibel/Captiva Island, Point Charlotte, Ave Maria, Florida area.